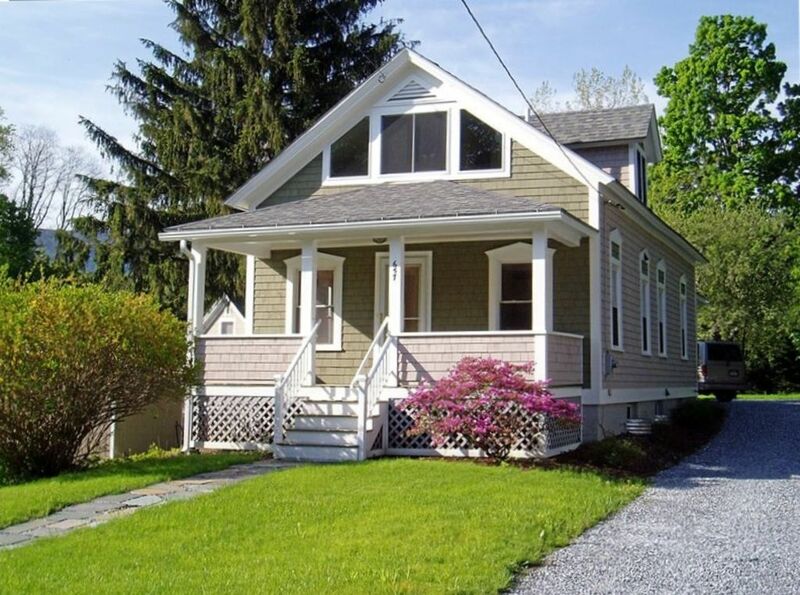 This beautifully restored small home in the heart of Williamstown is the perfect location for visitors to the attractions of The Berkshires. Walk to the theatre, the shopping & restaurants, the Williams College campus and the Sterling and Francine Clark Art Institute. The house features a wonderfully open kitchen and dining space that will accommodate up to eight. A king bed master bedroom, two twins in the second upstairs bedroom, a full sized futon in the 3rd bedroom and a queen sleeper sofa provides sleep for 7-8 in total. The covered front porch and back paver stone patio provide the perfect relaxation spaces. Paver stone patio, umbrella table and chairs. Location to downtown Williamstown - walk to theatre, museums, shopping and Williams Campus (only .3 miles). This property, right on Main St. in Williamstown was very easy from start to finish. The property is recently renovated, the kitchen is well stocked, the furniture is comfortable and the entire house was impeccably clean and welcoming. There is a driveway for 2 or 3 cars so very easy loading and unloading into the back door. My only warning is that if you are tall - over 6 feet - the upstairs bedrooms and bath have eaves that might be a little problematic. Or at least you need to be careful when moving around. Other than that, an extremely comfortable house. This house is located in a perfect location to walk into town or to take a short drive to Mass MoCA. It was very clean and the instructions were clear and appreciated. We spent most of the time in the kitchen around the large table doing puzzles and playing games and eating. This is one of the cleanest houses we have stayed in and it was extremely comfortable. We do a different house each New Years but if ever in this area again would love to come back to this one! Owners were very nice and had great communication. Thank you!! Cute, very comfortable, great condition, modern kitchen fully equipped. A very comfortable and clean cottage, equipped with everything we needed, down to books, games, puzzles. Modern kitchen and big dining area made staying in a delight. Close to campus and amenities. We will definitely come back next time we are the area. Excellent visit all the way around. Very comfortable, clean and well stocked with everything a guest would need. The owner was very well organized and responsive to any and all inquiries. Convenient location to downtown, college; great place to stay. It was a lovely home with plenty of space for us. Nice and clean. Centrally located to Williams and The Clark. We walked to trails with the kids. Great place. Sterling & Francine Clark Art Institute - 5 min. drive; Williamstown Theatre Festival - 0.2 mile walk; Taconic Golf Course - semi-private - 0.5 miles; MassMoca Contemporary Art - 15 min. drive; Jiminy Peak (skiing) - Snowy Owl (tubing) - 20 min. drive; Tanglewood - 40 min. drive.